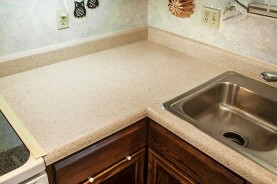 Formica® Countertops - Should I replace or refinish? Formica® is the leading manufacturer of laminate countertop material. It is used most often on kitchen countertops and bathroom vanities. Formica® countertops make great work surfaces because they are non-porous and easy to clean. 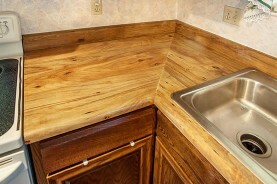 Unfortunately, any laminate countertop surface can be cut by sharp knifes, accidentally scorched by hot pans, or chipped. This normal wear and tear, or just out-of-date colors, will eventually require a change in your Formica® countertops. Before considering a change to granite or other solid surface countertop, consider the advantages of refinishing. Refinishing will almost always save you 30% to 50% over replacement and will save you the time and mess associated with replacement. 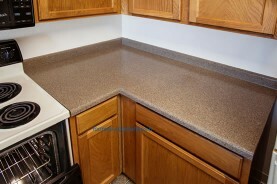 Tired Formica countertops can look new! Butcher block Formica is given an updated look! Formica® Countertops - What is the laminate refinishing process? Formica® countertops must be cleaned and de-greased before refinishing. Any burns, cuts, or chips will be filled, sanded and made level. Miracle Method’s MM-4 bonding agent is applied to ensure adhesion, then several layers of high tech acrylic enamel are applied to provide a smooth, durable finish that will last for many years. 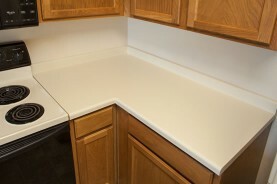 Most refinished countertops can be returned to service within 1- 3 days, depending on the selected colors and finishes. Formica® Countertops - Can I just paint them? "Yes"...Formica® countertops can be painted and over time people have used latex paints, epoxies, and even cans of enamel spray paint. However, the end result is far from the factory finish you will receive from a Miracle Method refinishing professional. Miracle Method uses coatings specifically created to restore and refinish Formica®, Wilsonart® and other laminate countertops. A Miracle Method refinished countertop will look better, last longer, and feel better than any attempt at painting a kitchen countertop using DIY refinishing kits. Only Miracle Method offers Natural Accents™, which are the latest stone-like finishes, available in dozens of designer colors. Formica® Refinishing - How do I find a professional refinisher? Miracle Method professionals are all trained and equipped to restore and refinish Formica® countertops. Click on Find a Location or call our toll free locator number, 1-888-271-7690, and get a free estimate from your local Miracle Method franchise.